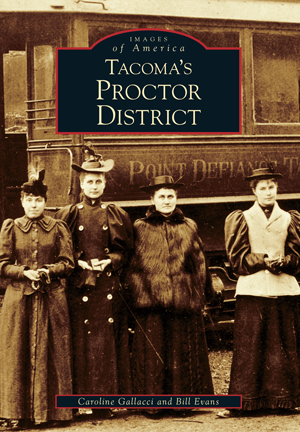 When Allen C. Mason launched his Point Defiance line in the early 1890s, the Proctor area became one of Tacoma's first streetcar suburbs. Before this time, Tacoma's North End was a remote, unsettled region populated only by those visiting the city's horseracing track. After Mason established a streetcar stop at the intersection of North Twenty-sixth and Proctor Streets—near the racetrack—businesses began to line the thoroughfare. By 1900, houses had been constructed within walking distance of the line, and a residential neighborhood provided the impetus for the construction of schools, a firehouse, churches, and a library. By the 1920s, the neighborhood had expanded and changed to reflect the introduction of the automobile as well as the district's popularity with University of Puget Sound students studying nearby. The community spirit that emerged then continues to this day. Author and Tacoma resident Caroline Gallacci has been an adjunct professor at various local colleges and universities and is cofounder of the Tacoma Historical Society. For this volume, Proctor-area merchant Bill Evans joins her in telling the history of the district. Through vintage photographs selected from private collections and the Tacoma Public Library, Gallacci and Evans provide a glimpse of one of Tacoma's first streetcar suburbs.